Minutes from Alexandria's historic Old Town as well as the attractions of Washington, D.C., this hotel features exceptional free amenities and services, in a central and convenient location. 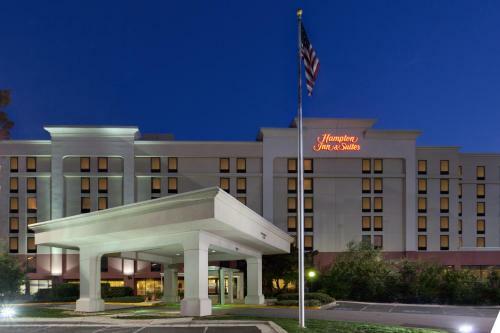 The Hampton Inn and Suites Alexandria Old Town Area South is ideally situated close to Interstate 95, allowing guests easy access to much of the surrounding area. The hotel also provides free 24-hour shuttle service to Old Town Alexandria and Huntington Metro station. Before visiting nearby Arlington National Cemetery or the Smithsonian Museum, guests at the South Old Town Hampton Inn can enjoy a free hot breakfast buffet or an energising workout in the modern fitness centre. At the end of the day, guests can relax in the outdoor pool. the hotel Hampton Inn & Suites Alexandria Old Town Area South so we can give you detailed rates for the rooms in the desired period.